Hi girls, Mila with you today! The first and very important thing is when you decide to play with watercolor pencil you have to be sure you have the proper cardstock.You can use cartridge paper or watercolor paper with your water-soluble pencils or with other words you need anything up 200gsm. For the purpose of this step by step tutorial I used Under the Sea Mae clear stamp set and Stazon ink. I really like it and it’s the right one for your watercolor projects because it doesn’t spread with water. I always start with background and apply the tones on layers like you do with your markers – first the lighter color and then the darker one just to be sure they are going to blend well. If you want to make a color stronger you have to apply another layer of the same tone but you need to be patient and wait the paper to completely dry up before doing it. For the tail I did the same – colored it with the lighter tone just to be sure. I already made the lighter area and then continued with the dark one and the ones that are in shadow. And it was time to start with the hair. My choice was to color it in light blond and I made the first layer with a really light warm yellow. I like watercolor pencils just because you can make as much shade tones as you want and this depends only on how much water you use. After that I finished her hair with three tints of brown and blended all with water and yellow. For the skin I used flesh color pencil and a little bit hot brown for the shadows. And here is the final touch – some bling in her eyes made with a white gel pen. Now don’t forget to check out all the posts this week for more fun coloring info! Next Post: Distressing and Quartering with Tabbatha! Mila, it looks gorgeous! The texture on the tail is fabulous. Love it! I’ve been wanting to try coloring my images with other media besides Copics so I’m thrilled with this week’s posts. All of my SOG images are digis though, so I’m wondering if this technique will work with printer images without having the ink bleed? Is there a way to do that? a laser printer would be your best bet I think Caryn. It might take testing but you could also try heat embossing the ink fresh out of the printer (sprinkle the powder on while its still fresh and wet then heat set) and see if that sets it. Or using ink that is waterproof. I know some printers, typically ones for printing photos, boast that. 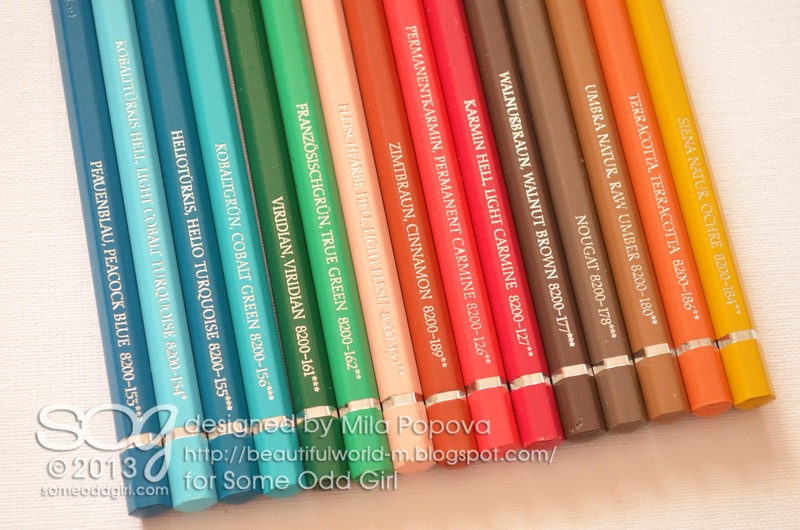 I love my watercolor pencils, but must admit that I do have difficulty with them, to achieve the look I want. Thank you so much for these tips!!! Wow, Mila this is awesome! Nice tut Mila! The water color pencils have a beautiful result! AWESOME water coloring! wow! Thanks so much for sharing! This is STUNNING Mila! I love the texture you achieved in her tail…thanks for the tutorial! love this tutorial….great week with all the tutorials. I love the drawn in “husks” and how it makes such dimension….just LOVE this image and the help! Thank you!